Chief Leahy and Capt. Stratton with certification from Ohio Collaborative. BATAVIA, Ohio (Sept. 23, 2016) – The Clermont County Sheriff’s Office meets the standards in use of force, recruitment and hiring that were established a year ago by the Ohio Collaborative Community-Police Advisory Board as part of the State of Ohio’s efforts to strengthen community and police relations. The Ohio Collaborative, a 12-person panel, established state standards – for the first time in Ohio’s history – on Aug. 28, 2015, for the use of force, including use of deadly force, and agency employee recruitment and hiring, to help guide law enforcement agencies in Ohio. “The state developed these standards so that all law enforcement agencies are on the same page when it comes to such things as use of force,” said Deputy Chief Steve Leahy. Under Sheriff Tim Rodenberg, the Sheriff’s Office has maintained very clear standards on use of force and recruitment. Very little needed to be changed to meet the new standards, said Capt. Chris Stratton, who organized the application process. “We were fortunate,” he said. “We had everything they were looking for.” A representative from the Advisory Board visited the Sheriff’s Office to review policies and standards and how they are communicated. The hiring process at the Sheriff’s Office is intensive, and involves testing, panel interviews, and background checks. Once hired, a new recruit goes through two weeks of orientation. That is followed by 12 weeks of field training with different officers on both day and night shifts, so that the recruit can handle a variety of calls. Probation continues for a full year. 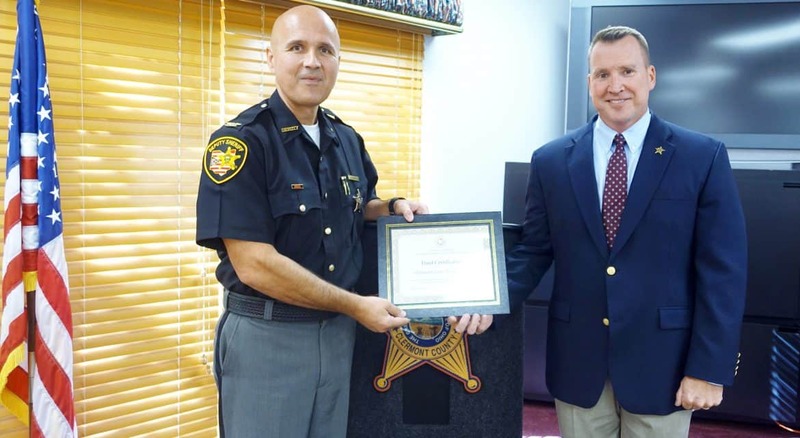 Ohio has partnered with the Buckeye State Sheriffs’ Association and the Ohio Association of Chiefs of Police to help certify Ohio’s nearly 1,000 law enforcement agencies to ensure that they are in compliance with Ohio’s new standards. The Miami Township Police Department and Milford Police Department are also certified in Clermont County. For more information on the Ohio Collaborative, the certification process for law enforcement and the complete list of agencies that have been certified, please visit: http://www.ocjs.ohio.gov/ohiocollaborative.